Keith Williams spoke at the opening of the firm’s latest project, the Luan Gallery, in Athlone, Ireland, the first purpose designed contemporary art gallery in Ireland’s Midlands. The project occupies a spectacular site on the banks of the River Shannon, adjacent the town’s historic bridge. The scheme adapts the town’s historic 1897 Father Mathew Hall into a new gallery, adds a new wing to provide temporary white box gallery space and a river ambulatory overlooking the Shannon and linking the two spaces. The project was formally opened by Jimmy Deenihan TD, Minster for the Dept of Arts, Heritage and the Gaeltacht on 29 November 2012, with Nicky McFadden TD, Mayor of Athlone Jim Henson and Miriam Mulrennan Manager Athlone Art & Heritage all in attendance. The Luan opened with an important inaugural contemporary art exhibition curated by IMMA (Irish Museum of Modern Art) entitled Borrowed Memories featuring important works such as Hughie O’Donoghue’s Blue Crucifxion and the Amelia Stein’s Loss & Memory and The Fragmens sur les Institutions Républicaines IV by Shane Cullen – created from the smuggled messages of the 1981 Maze Prison hunger strikers. 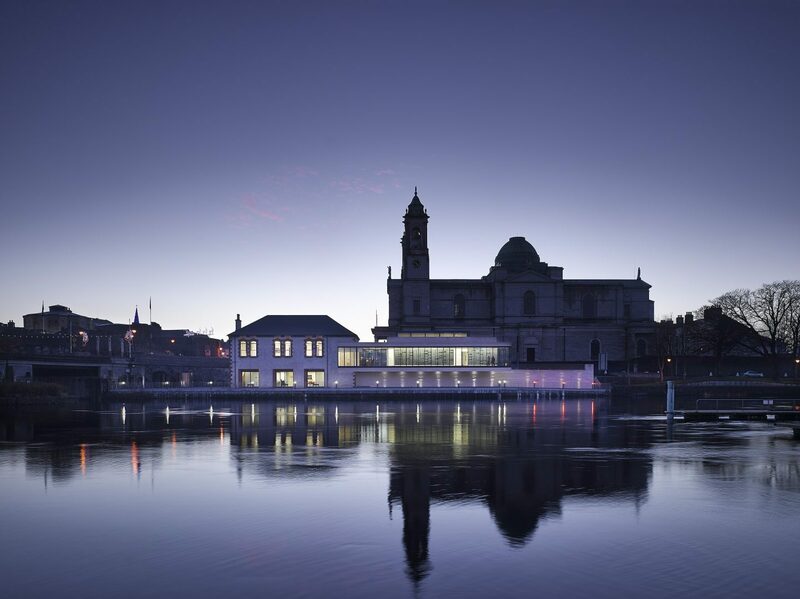 The Luan Gallery is the third project that Keith Williams Architects have designed in Athlone along with Athlone Civic Centre (2004) and the Army Memorial (2009). All three projects were commissioned by clients Athlone Town Council and Westmeath County Council, and form part on a 12 year collaboration between the architects and their public sector clients.